TIP: If your all purpose gluten free flour does not include a gumming agent, you will need to add 1 teaspoon xanthan gum. TIP: Save time by using canned pie filling (gf of course) and adding a few ingredients to make it your own. 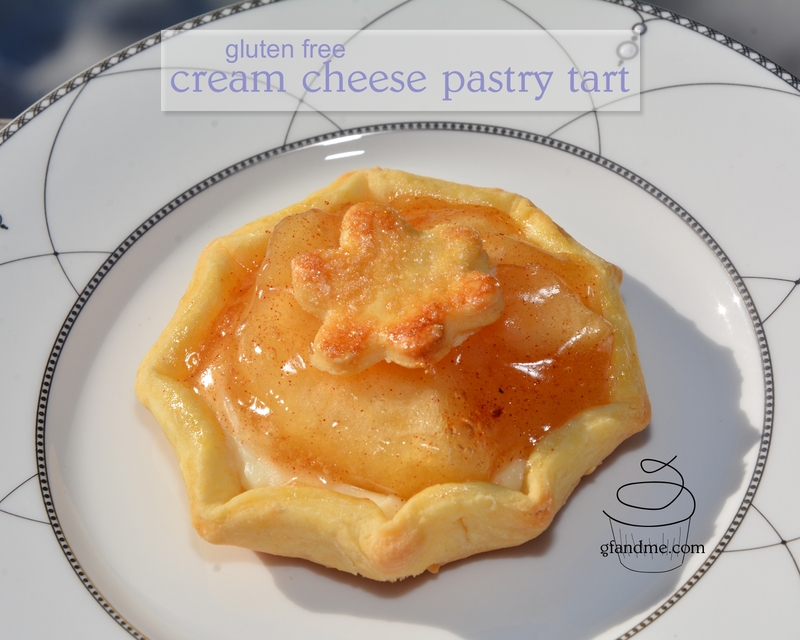 After all, you just made gluten free pastry! We used half a can of E.D. Smith apple pie filling and spiced it up with a dash of nutmeg and 1/4 teaspoon cinnamon, but this would also be fantastic with lemon, cherry, or blueberry. In small bowl, dissolve granulated sugar in water and add yeast. Set aside for at least 5 minutes. In another bowl stir together the egg yolk and sour cream. Set aside. In yet another bowl, stir together the cream cheese and icing sugar. Put flours and salt (and xanthan gum if needed) into your food processor and pulse to combine. Cut the butter into cubes and sprinkle on top of the flour. Pulse the mixture until it is crumbly (approximately 10 quick pulses). Stir together the yolk and yeast mixtures and drizzle over the flour in your food processor. Pulse just until the dough begins to come together. Lay a piece of parchment paper on your counter. Remove the dough from the processor, place on parchment and work it until it comes together nicely. Cover with a second piece of parchment and roll out to a about 1/4 inch thick. Now cut out as many tart shells as possible. TIP: We used a 3 inch round cookie cutter for this. Take what’s left of the dough and re-roll it, cutting out more shells (like you would with cookies). You should end up with 8 – 12 shells depending on size and the thickness of your pastry. Drop a dollop of the cream cheese mixture into the middle of each of the shells and smooth out. Fill the rest of the shell with your favorite pie filling. TIP: You can roll out the bit of pastry that’s left over and make a decorative flourish for the top using a small cookie cutter. Bake until the crust begins to brown (about 20 – 25 minutes). Remove from oven and let cool completely. These are best at room temperature. These will keep on the counter for a couple of days. This entry was posted in Baking, Drinks & Desserts, Recipes and tagged almond flour, bob's redmill, Cup 4 cup, food processor, gluten free, pastry. Bookmark the permalink.